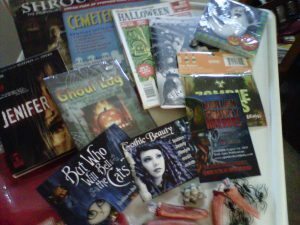 Sandy Musick (winner of the Halloween Mystery Bag) was kind enough to send along some photos of her opening the package. 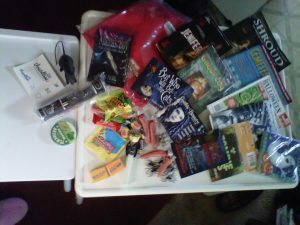 I thought it’d be nice to let everyone see what the contents of the mystery bag were, partly because half the fun of a surprise is discovering what it is, and partly because I plan on doing a Holiday Mystery Bag in December. This way you can get an idea of what *might* appear in the next one (holiday themed of course). Wow, how PC of me to not call it a Christmas Mystery Bag. I must be losing my offensive mojo. 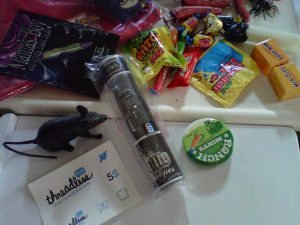 Speaking of prizes, I want to thank everyone who commented on my contest entry. I won! Thanks again for all your help, I couldn’t have done it without you. 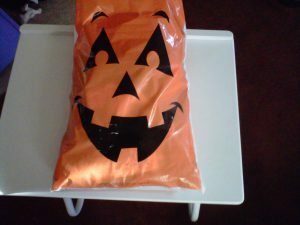 Now then, the content of the Halloween Mystery Bag (click a photo for the full-sized image gallery). Not a bad haul, right? I’ll do something equally (or even more) extravagant for the holiday giveaway. In the meantime, the next couple weeks will bring you a major announcement, psychotic ramblings, and at least one type of organ meat wrapped in bacon.